Unlike other rocky bodies in the asteroid belt, Ceres is an oblate spheroid, rounded with a rotational bulge around its equator. Scientists think Ceres may have an ocean and possibly an atmosphere. A probe will arrive in 2015 to study the object more closely and unlock those mysteries. Astronomers in the late 18th century mathematically predicted the presence of a planet between Mars and Jupiter, eagerly turning their telescopes to the region in search of the missing body. On Jan. 1, 1801, Sicilian astronomer Giuseppe Piazzi discovered what was then considered a planet, naming it Ceres for the Roman goddess of corn and harvests. Within a decade, four new objects were discovered in the same region, all also considered planets. 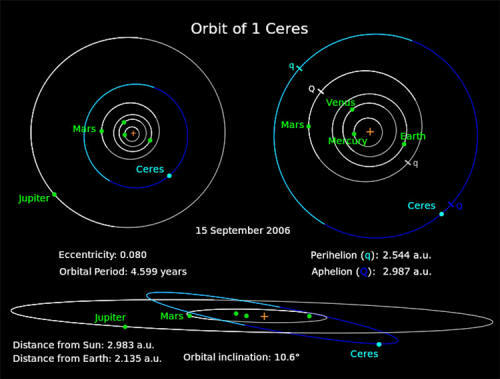 Nearly 50 years passed before more, smaller bodies were found scattered between Mars and Jupiter - the components of the asteroid belt - and Ceres was demoted to the status of an asteroid. 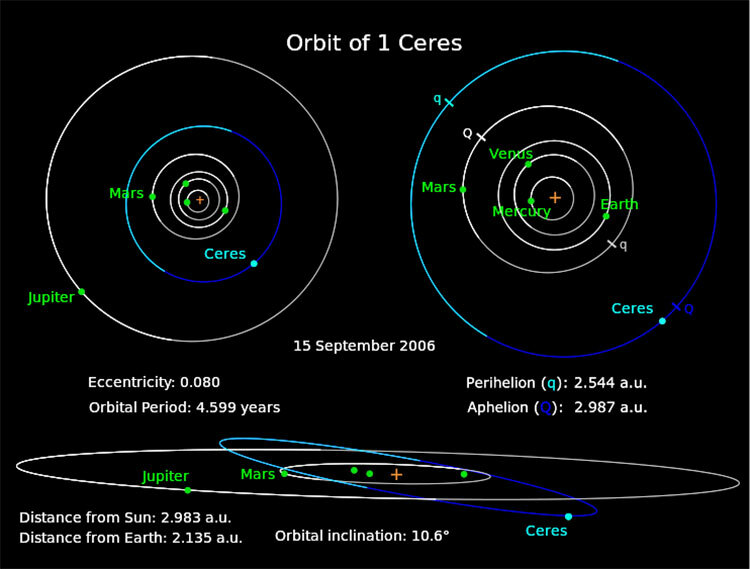 In 2006, Ceres was promoted to the status of a dwarf planet; it did not reach full planetary status because it failed to gravitationally clear its neighborhood of debris, though it often retains its classification as an asteroid, as well. 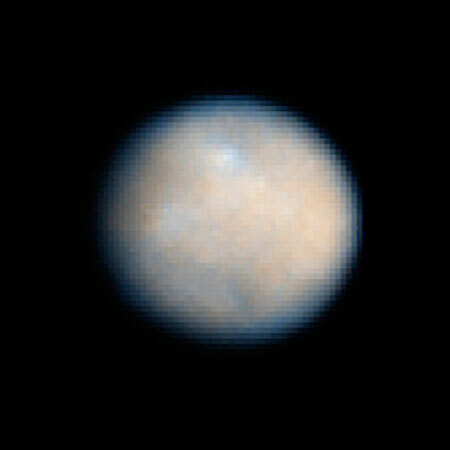 The largest object in the asteroid belt, Ceres makes up nearly a third of its mass. Even so, it remains the smallest known dwarf planet, only 590 miles (950 km) across - roughly the size of Texas. A day on Ceres lasts a little over 9 Earth-hours, while it takes 4.6 Earth-years to travel around the sun. Ceres has a density of 2.09 grams per cubic centimeter, leading scientists to conclude approximately a quarter of its weight is water. This would give the dwarf planet more fresh water, than Earth contains. a thin outer layer of dust and rock over an icy layer. 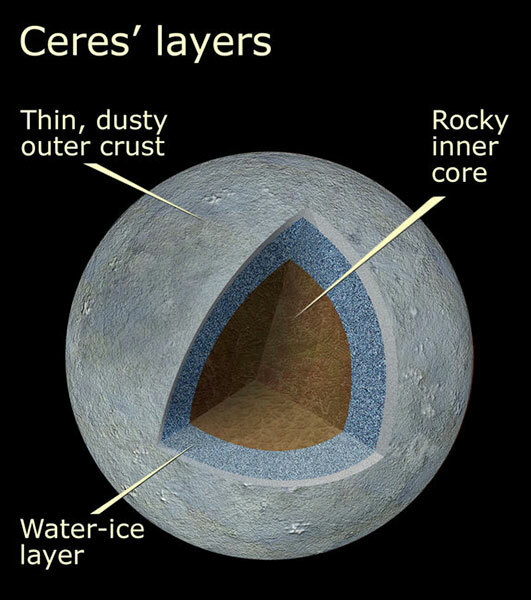 With temperature highs of minus 38 degrees C (minus 37° F), water at the surface of Ceres would sublimate, potentially creating a thin atmosphere. Signs of possible sublimation were observed at the dwarf planet's north pole in the early 1990s, but were ambiguous and have not been seen again. Instead, scientists think that water-ice serves as the mantle of the dwarf planet. The thin, dusty crust is thought to be composed of rock, while a rocky inner core lies at the center. Spectral observations of Ceres from Earth reveals that the surface contains iron-rich clays. Signs of carbonates have similarly been found, making Ceres one of the only bodies in the solar system known to contain these minerals, the other two being Earth and Mars. Formed by a process that involves heat and water, carbonates are considered good potential indicators of habitability. Ceres won't hold onto its secrets for much longer. In 2015, NASA's Dawn mission, which has already visited the asteroid Vesta, will take up orbit around the tiny planet. Instruments will measure its mass and density, and map the rocky body in detail. More insight about its ocean should be revealed, as well as information about the crust.